Autorickshaws are omnipresent in our country and they are the lifeline for passenger transport. Some would say death-line! These ubiquitous three wheeler passenger vehicles are available across the country, but the noise and air pollution they produce is enormous. While researchers and authorities are trying to find a solution to curb this hazardous pollution, some street smart innovators rolled out electric powered rickshaws on the road! Typically, autorickshaws are built to carry three passengers and a driver. However, overloading is an incessant problem. They are mainly powered by petrol engines, but these days, most of them have become diesel driven due to cost factor. Among them, the larger sized diesel-powered Tuk Tuks or six-seater rickshaws are particularly noisy and polluting. This situation is further aggravated in narrow congested roads in small towns of India. Fortunately, electric rickshaws or E-rickshaws have arrived in the scene, offering an eco-friendly alternative to the polluting autorickshaws. An e-rickshaw can provide a non-polluting and a silent transport system for urban and rural areas of India. Economic analysis done by researchers show that these rickshaws can provide an environment friendly, energy efficient and cost effective transport system, which can replace the existing auto rickshaws. There are mainly two types of e-rickshaw in India currently. One is an improvised electric cycle rickshaw, which is essentially a tri-cycle with an electric motor fitted at the back to reduce manual labour for the rickshaw puller. The other one is a completely electric powered vehicle that runs on a brushless DC motor powered by a battery. 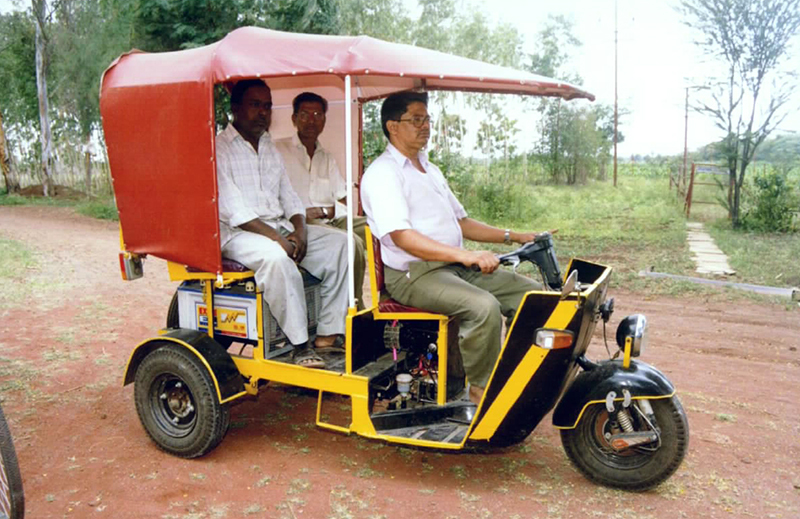 Way back in late 1990s, Anil K. Rajvanshi of Nimbkar Agricultural Research Institute made the first attempt to design a motor assisted pedal rickshaw (MAPRA). These MAPRA e-rickshaws have a small motor with battery is attached to the rickshaw that can run at a speed of 14-16km per hour. They can go around 40 to 45kms on every battery charge and the cost of these rickshaws is INR35,000 presently. While this model was beginning to accepted among rickshaw pullers, the Chinese invasion happened in late 2000s. Local automotive manufacturers imported the Chinese units and began selling the assembled e-rickshaws. Built on a chassis of mild steel frame, these vehicles have a brushless DC motor running on 48 volts power supplied by a standard lead acid battery. These lead acid batteries are the only drawbacks for an e-rickshaw, which need charging everyday and are costly to replace. Lack of public charging points further aggravate the problem. By 2012, there were about 10,000 e-rickshaws running on the streets of Delhi. Similar vehicles were beginning to be seen in other cities as well. Just when the e-rickshaw revolution was about to take off, the central government came crashing down on it, citing lack of license, accidents and speeding issues. According to the Motor Vehicles Act 1988, these electric rickshaws are not standardised vehicles and there is no need for any license to run them! While anyone can own and operate an electric bike or a car without license, we cannot operate a commercial vehicle on Indian roads. So obviously these e-rickshaw operators were illegal and they had to be regularised. But instead of finding ways to regularise these e-rickshaws, our government conveniently banned them. Surprisingly, e-rickshaws in Agra remained unaffected by the ban in Delhi! Fortunately, some social activists such as Shanawaz Khan, Sugrive Dubey, Chandra Vikash and others, took up the cause of e-rickshaws and campaigned for a registration process for them. Camps are organized in which all the interested e-rickshaw owners and drivers can apply for learners license, in case of any queries they can also contact the helpline number 011-42400400. Leading social activist Chandra Vikash said “Electrical vehicles will be handy, as they are low on economy and high on ecology. We could keep the pricing at INR1.5 per passenger per kilometer as we would use electric cars, three-wheelers and bikes. 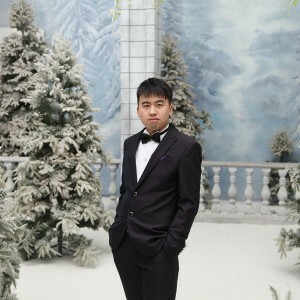 Acceptance and penetration will be high, and it will reduce travel time”. Finally, after much deliberation, the Parliament has passed an amendment to the Motor Vehicles Act in March 2015 to allow battery-powered e-rickshaws as a valid form of commercial transport. The amended bill defines e-rickshaws and e-carts as — three-wheeled vehicles running on battery power of less than 4,000 watts and meant to carry four passengers or luggage up to 50 kg, covering a distance of within 25 km in a single trip. Naveen Rabelli, a Bangalore-based electrical engineer has created another innovation by introducing solar rickshaw. He was tired of dealing with the rickshaws, which caused much pollution on the streets of his city. Rabelli plans to take a road trip with his custom built solar powered tuk-tuk from Bangalore to London, hoping to show people how a small team without much resources can travel long distances using clean energy. People like Anil Rajvanshi and Naveen Rabelli are trying to prove their potential and bring changes in the traditional ways of transportation, without harming the environment.